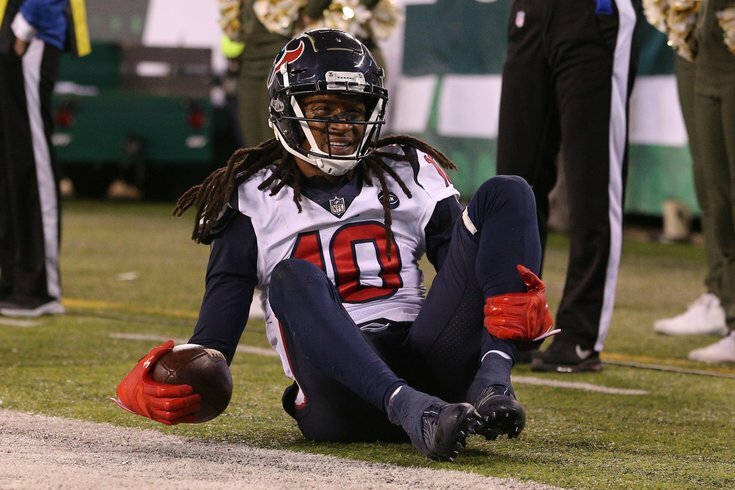 DeAndre Hopkins hurt his ankle last Sunday against the Jets, but he'll play Week 16 against the Eagles. As we say every week, the Philadelphia Eagles' injury report is loaded with ailing players, and their Week 16 matchup against the Houston Texans is no different. Jordan Hicks will return to the lineup, as he did not appear on the injury report. Hicks last played Week 11 against the New Orleans Saints. • QB Carson Wentz : Wentz is likely done for the rest of the regular season, and also probably for the playoffs, should the Eagles make it that far. That said, the team has not yet placed him on IR, so they have not yet shut him down for the season. • LG Isaac Seumalo (pectoral): Seumalo was injured against the Cowboys, and Stefen Wisniewski filled in at LG. Wis held his own (with plenty of help) last Sunday against Aaron Donald, and I suspect the Texans will line up J.J. Watt against him at times this Sunday as well. • LB D.J. Alexander: Special teamer only. Alexander recovered a fumble last Sunday in L.A.
• DT Bruce Hector: With Timmy Jernigan playing, the Eagles don't need Hector active. • OT/OG Matt Pryor: Pryor has been inactive for every game this season. • CB Chandon Sullivan: With Avonte Maddox playing, the Eagles don't need Sullivan. Mailbag: Should the Eagles trade for Jalen Ramsey this offseason? • WR Mike Wallace (IR): Wallace, formerly the Eagles' No. 2 receiver, broke his fibula against the Buccaneers. Doug Pederson has noted that Wallace is doing well, but he is not yet ready to return. • ST Chris Maragos (PUP): Maragos is still recovering from a serious knee injury suffered Week 6 last year against the Carolina Panthers. He had a second surgery on his knee this week. • RB Lamar Miller (ankle): The Texans' leading rusher so far this season is Miller, who has rushed 193 times for 917 (4.8 YPC) and 6 TDs. There's a possibility that D'Onta Foreman could make a return to the lineup for the first time since he ruptured his Achilles in November last season. Whether it's a rusty Foreman, or an ineffective Alfred Blue, the Texans' run game is likely going to be hampered to some degree. • WR Keke Coutee: Coutee is a rookie receiver with 4.43 speed. When he has played, he has been productive, catching 28 passes for 287 yards and a TD in just 6 games. • DT Brandon Dunn: Dunn is a rotational defensive lineman. He has 24 tackles and a forced fumble on the season. • S Mike Tyson: Tyson has 50 career wins (44 by way of knockout), 6 losses, and two bouts resulting in no contest. • CB Shareece Wright: Backup corner. • OT Roderick Johnson: "Rod Johnson" is a great name. • DE Joel Heath: I know nothing about this person. • WR Will Fuller (IR): Fuller has 4.32 speed and was the Texans' deep threat, before he tore his ACL. In seven games this season, Fuller had 32 catches for 503 yards (15.7 YPC) and 4 TDs. • RT Seantrel Henderson (IR): Henderson was the Texans' starting RT. He had surgery to repair a broken ankle, and is done for the season. The Texans' current starting RT is Kendall Lamm. • CB Kevin Johnson (IR): Johnson is a former first-round pick of the Texans, and regular contributor. He went on IR after suffering a concussion Week 1 against the Patriots. • CB Kayvon Webster (IR): Webster came back from a Ruptured Achilles for two plays, when he injured his quad and went on IR. • LB Brennan Scarlett (IR): Scarlett went on IR with an ankle injury. In 2018, he had 18 tackles, 3 pass breakups, a pick, and a forced fumble in 12 games.